1. Mix With Red Color Shades : you can wear the polka dot trend by mix it with red color like ad to it red jacket or burgundy pants. 2. High Waist Pants : you can wear a polka dot top with high waist pants for more 70s look. 3. Mix It With Leather : you can mix it with leather like wearing polka dot top with leather skirt or by wearing a leather jacket with polka dot pants. 4. All Over White : you can wear a white polka dot top with white skirt or pants. 5. 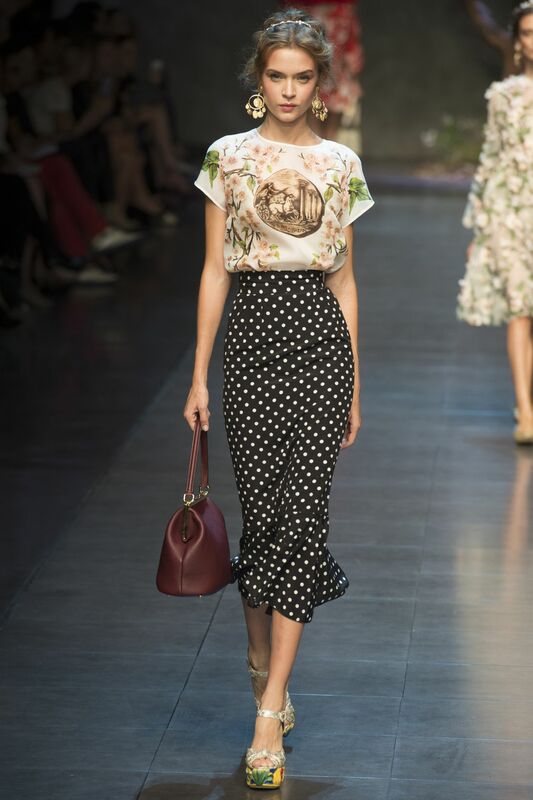 Cropped Top : you can wear a cropped jacket or cardigan over your flared polka dot dress for more romantic look. 6. Sheath Dress : you can wear a sheath polka dot dress for more classic look. 7. All Over Black : you can wear your black polka dot top with black pants with black blazer or cardigan for more sophisticated look. 8. Vintage Look : you can wear a lace polka dot dress if you love the vintage look. 9. Mix It With Bold Color : you can wear your polka dot top with a yellow color skirt or bold pink pants. 10. Wear It With Tank top : you can wear a tank top with your polka dot pants or skirt for more causal look. 11. Maxi Polka dot Dress : you can wear maxi polka dot dress with heels and bright lipstick or you can wear it with scarf or hat with gladiator sandals for more bohemian look. 12. Mix It With Lace : you can wear your polka dot skirt with lace top for more feminine look. 13. Button Up Shirt Under Polka Dot Sweater : you can wear your classic button up shirt under polka dot sweater with necklace for more preppy look. 14. Wear IT With Sweater : you can wear your polka dot skirt with sweater specially beaded sweater for more feminine look. 15. Mix It With Tulle Skirt : you can wear your polka dot top with tulle skirt for more girly look. 16. Mix It With Pastel Colors : you can wear your polka dot top with pastel color for more feminine look. 17. Peplum Top : you can wear your polka dot skirt or pants with peplum top for more ladylike look. 18. Mix It With Jeans : you can wear your polka dot dress with jeans blazer for more causal look. 19. Overall : you can wear your t-shirt under your overall polka dot or you can wear your polka dot top under overall. 20. Pink Polka dot : you can buy pink polka dot top or dress for more girly look. 21. Maxi Skirt : you can wear your polka dot top with maxi skirt or you can your your maxi polka dot skirt with white top. 22. Polka Dot Jumpsuit : you can wear a jumpsuit with polka dot pattern for more causal look. 23. 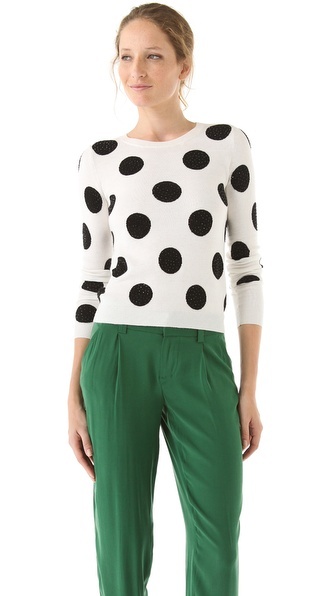 Mix It With Green color : you can wear your polka dot top with green pants or skirt for more stunning look . 24. Polka Dot Vest : you can wear white sheer blouse under your polka dot vest for more chic look. 25. Blazer And Slouchy Pants : you can wear with your polka dot top blazer and slouchy pants for more work look. 26. Polka Dot Blouse : tuck your polka dot blouse into pants and skirts for more feminine look. 27. Mixing Black And Grey : you can wear your polka dot bouse with black coat and grey pants for more office look. 28. Mixing Patterns : you can mix floral pattern or striped with polka dot or any another pattern with it. 29. Polka Dot : if your not fan of the trend or just want to ad small touch of it you can just ad polka dot scarf to your look. 30. All Over Polka dot : you can wear all over polka dot outfit or you can mix big polka dot pattern with small one.